Photojournalists from the 1960's popularized the phrase, "Tri-X, f/8, and be there" to describe the three most important aspects of their job. While a forgiving black & white film and a moderate aperture may not be paramount for most photographers today, there's no getting around that last part. The importance of "being there" has been underscored in my own experience many times, and I'd like to share one of those stories with you today. During the last two or so years, it was increasingly apparent that our family farm where I grew up wouldn't hang around in its current form much longer. The city had already enveloped our little 40-acre plot, and my grandma -- who had bought the land with my late grandpa in 1938 -- was steadily deteriorating. My dad has been planning to subdivide and/or develop the land for a while now, but wanted to hold off until Grandma was gone. That happened last month. Consequently, I've been making a concerted effort to photograph the farm as I knew it before it becomes no more than a memory. This has meant numerous early mornings spent lugging camera gear around the pastures and through the house in search of photo ops. It was on one such Saturday morning -- 6 November 2010 -- that I arrived at the farm just after first light and started looking for a good spot to catch the sunrise. I had hopes of seeing the deer or turkeys that frequent our land, but they never did appear. As I was heading past the house with my camera and tripod slung over my shoulder, Grandma appeared at the door and offered me a delicious treat of some sort. She was a farm wife, and was always up early, even at 93 years old. As much as I enjoyed her cooking and conversation (her cinnamon rolls were to die for), I knew they would still be available a few hours later. The same could not be said for the first light of day, so I politely declined. After all, that is what had drug me out of bed before dawn on my day off. I setup just beyond her flower bed with my 10mm lens on my tripod, planning to capture the light streaming through the trees and strafing across the pasture. Just as the sun was starting to peek through the trees at the far end of the east pasture, a red fox stepped out of the trees and into the clearing about 60 yards away -- directly between me and the rising sun. We see this fox occasionally, playing with the deer or harassing the wild turkeys, but only about once a month. He's a reclusive little guy. 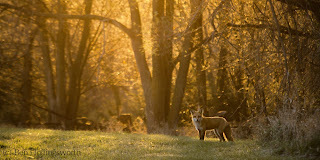 To see him this morning, with his fur rim lit by the rising sun streaming through the trees, was quite a treat. Alas, here I was, half a pasture away with a 10mm lens. I'd left my Tele-Vivitar 400mm lens back in the Jeep that morning. It's a bazooka of a lens, manual focus, and heavy enough that you don't want to carry it around unless you honestly expect to use it. Fortunately, I did have my smaller Canon 70-300m IS lens in the bag at my feet. I knew 300mm wouldn't be long enough to get in terribly close at that range, but it was the best I had (and honestly, not a great deal worse than 400mm). I quickly scrambled to swap lenses on the 7D, which was already mounted on the tripod. There was no other noise that still morning, so my slight commotion was easily audible by the fox, who turned to see what was going on. I focused as best I could and squeezed off one shot using the same manual exposure settings that I had prepared for the 10mm pasture shot. I was shooting directly into the sun, and new that I couldn't trust my camera's light meter, so I pulled back to check the LCD. The exposure was pretty good -- maybe a half stop too bright. I raised the camera to my eye again for a second, vertical shot. When I looked back through the viewfinder, the fox was gone. I had disturbed his peaceful morning walk, and he had seen enough of me. That single frame was all I got. Fortunately, it was quite usable. In my rush to mount the lens, I had neglected to remove the UV filter, so the resulting image had some flare. Shooting into the sun always results in a lower contrast image than what your eye sees. Still, it didn't take much to clean up the image enough to accurately represent my experience that morning. I did get my wide angle pasture shot, as well as a number of other real keepers on that beautiful fall morning. In fact, several prints from that morning are currently on display in our church foyer in a project depicting the magnificence of God's creation. I also got to spend plenty of time with Grandma on numerous occasions before she passed away eight months later. The point of this whole story is that I was there. I was focused on a goal which required a number of (albeit minor) sacrifices to achieve. I'm not a morning person, but I crawled out of bed before first light to get out to the farm. I love my grandma and her cooking, but I had to pass on the offer to enjoy them in order to be where I needed to be at the right time. I had to plan ahead and have on hand the necessary equipment to capture an unexpected and rare moment of beauty at the end of the day. We all admire nature and wildlife photographers who capture the beauty of creation, and many of us wish we could visit those locations ourselves. Few of us realize, though, the amount of work and dedication that goes into capturing those few incredible frames. These same principles apply to all areas of our lives if we want to be good stewards of the time we've been given. Avoid distractions, stay focused, and be prepared. The results can exceed your greatest expectations. I'd love to hear your own thoughts about this. Please leave them in the comments section below.